Sight Words are words that children instantly recognize without having to decode them. They are typically high frequency words contained on common lists like the famous Dolch Series or Fry Lists. It is important to understand that “sight words” were originally defined as words with such irregular spellings they had to be memorized. Later, memorizing all high frequency words by sight became the major mode of learning to read in whole language approaches, a huge stray from the original definition. Today, the terms "Sight Words" and "High Frequency Words" are mistakenly used interchangeably. When teaching reading one of our goals is to make high frequency words instantly recognizable, no question about it. But since most high frequency words are decodable a good way to make them recognizable is to at first teach children to decode them instead of using just strict memorization. As they practice their word analysis skills their abilities to instantly recognize these words will increase eventually turning high frequency words into sight words for them. Sight Word Or High Frequency Word? There are 38 high frequency words that are NOT decodable and will have to be learned by sight. Every other high frequency word is decodable. These words are contained on common lists like the famous Dolch Sight Word Series or the Fry List. These are the ones that cannot be decoded. Children can read the other words by being taught to decode them, they do not have to be strictly memorized. A word wall is a list of words that are related to each other in some way. 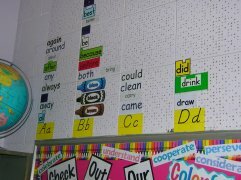 Word walls are used as a tool to teach a language concept. 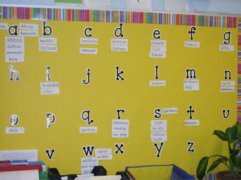 Often, they are displayed in large letters on a wall and used in collective classroom exercises, but smaller printed word wall word lists can be used for a variety of teaching exercises. Have students write a word (that they can read) from the Word Wall on each crust. Students color a pepperoni slice when a word is called out that they have written. Once all of the pepperonis are colored, the student calls out "Word Wall Pizza" and reads all of their words to the class. During the first few weeks of school, CVC and CVCC words are added to the Word Wall. Throughout the year, add non-decodable words to the wall. Using a flashlight, turn off all of the lights, sing the song, and shine the flashlight on a word. Have a child say the sounds in that word and put them together to "read" the word. Repeat this song and shine on another word to be read! This is a sample letter that is sent home when non-decodable words are introduced. Feel free to modify this document to fit the needs of your classroom. 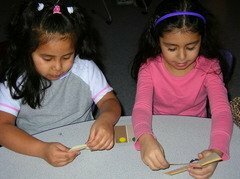 For more information on how to teach children to read non-decodable words, check out the Reading Activities II Page. The above parent letters can be sent home to families to give them ideas for working with their child at home. (I prefer to put one idea on my newsletter that is sent home each week). Children are encouraged to share new ideas they have for working with words at home! Each day students practice 5-10 words that are kept on a metal ring. Words are chosen for each student by the teacher. When the student is able to successfully read the word without any help, a tally mark is given. Once ten tallies are on a word card, it is taken off. Students have a special binder labeled, “Words I Can Read”. Ring Words that are taken off are written down in this binder and then glued on the above template to take home to share with their families. Students get very excited when they are able to take their words home! 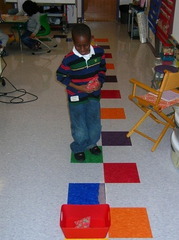 Check out this fun game for students to play to help them with sight words. Print, laminate, and cut out game pieces. Students take turns pulling out words until they can't read the word or until they pull out a "special" card. Complete directions are included in the game! Kids learn the Top 300 Sight Words with this fun card game. Great for small group, center activities and easy for parents to use at home. Place cut-out cards in a basket and have students take turns practice reading their sight words. If students pull out an "apple" and read the word correctly, they get to keep the word. 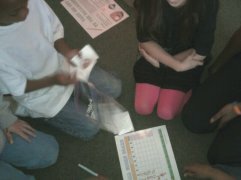 When students pull out the "basket" they get another turn and when a "worm" is pulled out, they must put all of their cards back. The student with the most cards at the end is the winner. Oh, No! Put all of your cards back! 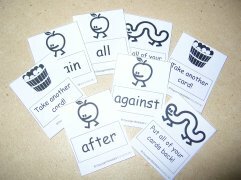 Use this card game for children to practice over 150 high frequency words from the Dolch Sight Word List. Cut out the cards and place them in a container. If they are read correctly, the child gets to keep them. When an 'Oh, No!" card is pulled, the child must put all of their cards back. Whoever has the most cards at the end of the game wins! Using the above template, write Dolch words with 1-5 sounds in the left-hand column. Have students count how many sounds they hear in each word and write that number in the middle column. Give your child 5 bean bags and place a basket in front of them (distance depends on their ability to throw). Children throw a bean bag for each sound they hear in a given word. A point is received for each bean bag that makes it into the basket. (Make sure your child is saying the sounds they hear as they throw the bean bag). When they are finished throwing, have them count up their points to determine the grand total. Write high frequency Dolch or Fry words (depending upon the ability of your students) in the left column. Have your child roll a dice and say the sounds that corresponds with that number. If they are able to read the word successfully have them color a square on the graph. Try to see which word can win the race. 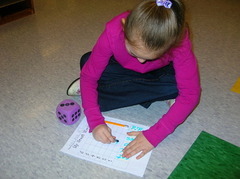 For a math challenge, use two dice and have your child add the numbers together to determine which word to read. Have children practice writing words by tracing each with at least five different colors. The size of the font should be determined depending upon the age and fine motor skills of your children. Go to Free Fonts for Teachers to download this font to your computer. Make a list of the words your child is working on using the "Scramble" Font found at fontgirl.com. 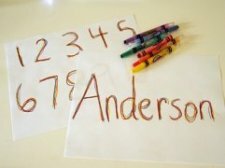 Have your child add up the numbers to come up with a total value for each word. This can also be done with actual "Scrabble" game pieces! 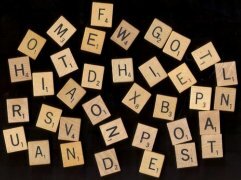 Take a look at our Advanced Code Scrabble Words on the Reading Activities II Page. Scrabble Words are sorted by vowel sounds. Go to handwritingworksheets.com to make custom handwriting worksheets. These are great worksheets because they have yellow dots for each letter to show children where to properly begin when forming a letter. Click on "Basic Print," "D'Nealian Style," or "Cursive" and type your words in the space provided. Do not place commas between your words...Change the printer settings on your computer to print in "landscape". Help children practice sight word fluency by writing the first letter below the word and continue adding a letter on each line until they have completely spelled the word. 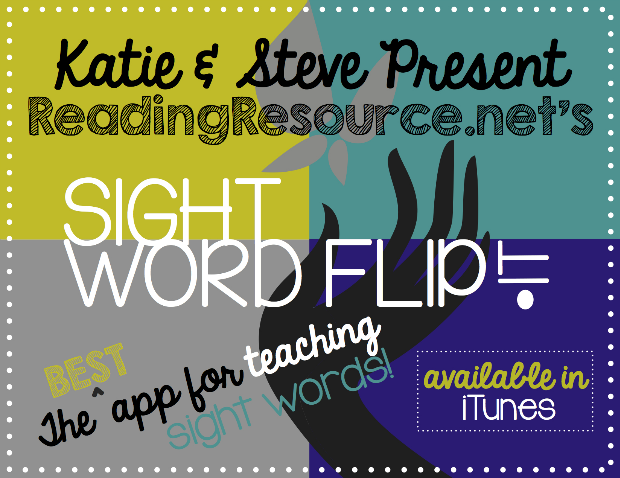 Find more Activities for Sight Words @ Our Download Central Page!